With over 200 attendees, sponsorship at the Annual Conference is an effective marketing and relationship-building platform providing access to key decision makers and leaders in public media. Your organization will have the opportunity to engage customers with your products and services and improve your relationship with key players in the public media industry. Should you see greater benefit in opportunities for year-round presence and visibility with PMBA, please email Brandon Lawrence at blawrence@pmbaonline.org or call (240) 801-3749. Logo in conference marketing messages and on the PMBA conference webpage. Logo in conference program, onsite signage, digital signage, and mobile app. Verbal recognition from the podium during prominent gatherings. Sponsor ribbons for all participants attending on behalf of your company. One prominently placed tabletop display. must be approved by PMBA and sent via email). One premium placed full-page advertisement in the conference program. Roster of opt-in attendees sent post-conference, to include name, company address, and phone. Banner ad on the PMBA website (pmbaonline.org) for 90 days with a link to your homepage. 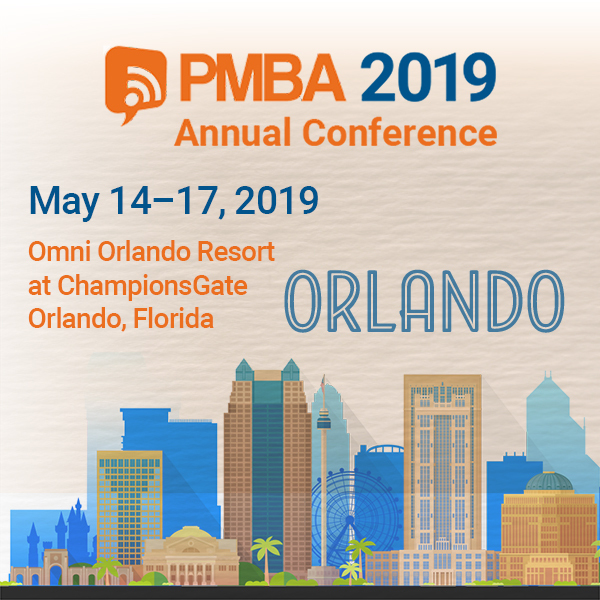 Opportunity to submit an article for PMBA Statements e-newsletter. Program Director — $20,000 — SOLD! 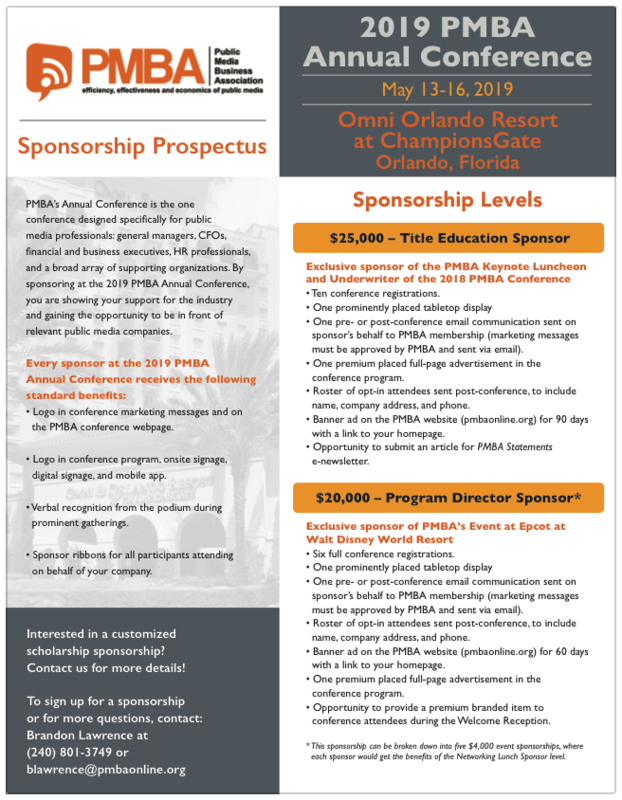 One pre- or post-conference email communication sent on sponsor’s behalf to PMBA membership (marketing messages must be approved by PMBA and sent via email). Banner ad on the PMBA website (pmbaonline.org) for 60 days with a link to your homepage. Opportunity to provide a premium branded item to conference attendees during the Welcome Reception. Opportunity for a corporate representative to make two minutes of welcome remarks and introduce the keynote speaker. Opportunity for a corporate representative to make two minutes of introductory remarks at your sponsored event. Opportunity to provide a branded item to conference attendees at your sponsored event. One half-page advertisement in the conference program. One full-page advertisement in the conference program. Choice of one tabletop display (includes 6-foot table and two chairs) OR one full-page advertisement in the conference program. Logo in conference program, onsite signage digital signage, and mobile app. Don’t See Something that You Want? Call Us! For more information on any of these opportunities, please email Brandon Lawrence at blawrence@pmbaonline.org or call (240) 801-3749.